Lazy A Stables Ltd. - Feedback - Email from Kitty Eckert, Florida. I just wanted you both to know how delighted we are with our purchase of Yogi from your Lazy A Stables last January. We had never actually seen Yogi ~ except for pictures on your web site and a video you sent to us ~ until May. He is everything you said he would be and even better!! From your stables in Canada he traveled to North Carolina where he was in training under saddle. From all updates with that trainer, Yogi was easy from Day 1. 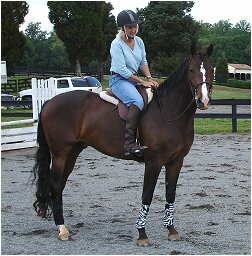 We did not have him shipped to us in Virginia until just now (4 months later), where we can now get on him and ride. He is the kind of horse that just really tries hard to please and be good every step of the way. Actually I found Yogi quite by accident, surfing the web for young prospects. He is a wonderful type, and I went from there. Janet was helpful and honest in all her description of Yogi and I knew he'd be the type of youngster I could enjoy in riding and bringing along. His jumping style on the video tape was icing on the cake. Now that we have him here, his personality and cheerful disposition are also an added bonus. We look forward to taking him to Florida at the end of summer and starting to show him there. Yogi is just a really fun guy, THANK YOU!